Sevilla's bike conference, Velo-City Sevilla, brought together international bike advocates and celebrated Sevilla's bike-friendly city, as pictured above. Photo by Giulia Gasparro. Welcome back to TheCityFix Picks, our series highlighting the newsy and noteworthy of the past week. Each Friday, we’ll run down the headlines falling under TheCityFix’s five themes: mobility, quality of life, environment, public space, and technology and innovation. The Thailand government approved a $4.95-billion high-speed rail project to be co-developed with the Chinese government. The 620-kilometer project connecting Nong Kai in northeast Thailand and the capital city of Bangkok is expected to break ground next year and begin operations in 2016. The U.S. Federal Transit Authority (FTA) proposed raising the assumed average weight of bus passengers, as national weight statistics have risen significantly since the most recently incorporated statistics from 1960-1962. With the national average weight of 194.7 pounds for men 20 years and older, and 164.7 pounds for women of the same age range, the FTA believes an implemented average weight of 175 pounds will be appropriate for bus testing. German car company, BMW announced it is entering the carsharing world in April with a fleet of 300 vehicles in Munich and 500 vehicles in Berlin. As delays in Edinburgh, Scotland’s tramcar project have resulted in a tramcar surplus, it now appears that London will receive tramcars to help aid their growing program. Trams in London have become steadily popular since their reintroduction to the city, with ridership up almost 50 percent. In the wake of Japan’s devastating earthquake, production shutdowns will likely raise the price of Japanese automobiles. Such price increases would likely include the popular Toyota Prius hybrid. The recently released 2011 Delhi state budget allocates about 25 percent of funds to public transportation and showcases the city’s commitment to reducing traffic congestion, improving the commuting experience, and fighting climate change. The Delhi government plan includes the construction of 14 more bus rapid transit (BRT) corridors. Sevilla, Spain celebrated its growth as a biking city this week with an international bike conference, Velo-City Sevilla. 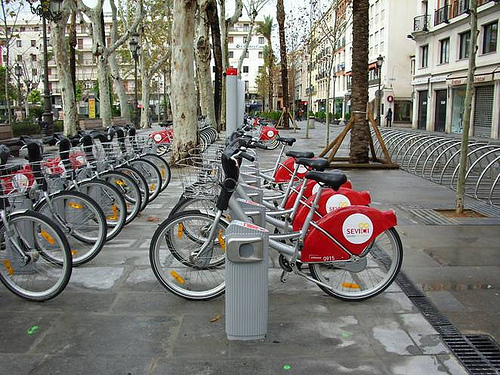 Hundreds of bike advocates from around the world gathered to revere in Sevilla’s successful transformation from congested car-dependence to a bike-friendly city of green cycletracks and bikesharing. The U.S. Environmental Protection Agency (EPA) displayed interest in supporting non-traditional fuel sources this week by approving higher ethanol content in fuels. The newly approved gasoline will boost ethanol content by 5 percent to make fuel a mixture of 15 percent ethanol. Paris’ city government further emphasized France’s enthusiasm for plug-in hybrid vehicles this week with a ceremonial induction of Toyota Priuses into the City Office fleet. France already boasts a governmental fleet with more than 100 plug-in-hybrids and an extensive charging infrastructure. Volvo Cars was named the best sustainable car maker this week by Sustainable Brands 2011, a Swedish survey of 151 car companies. The survey was based on a consumer perspective of environmental and social responsibility. Architecture Canada announced Montgomery Sisam Architects as the recipient of its 2011 Architectural Firm Award. With a staff that is nearly all LEED-accredited, Montgomery Sisam is widely regarded as a practice that understands that green design is integral to both good planning and good architecture. Despite already amassing sufficient funds, Governor of Ohio John Kasich recently established opposition to the long-anticipated Cincinnati streetcar project by proposing to withdraw state funds, citing the project was an inappropriate use of public resources. The streetcar project has been regarded as a viable component in developing the city and reducing traffic congestion. Adding to its repertoire of indispensable life-tools, Google announced its popular Google Maps service will now feature the location of electric vehicle charging stations in the U.S. Google acquired the charging station information from the U.S. Department of Energy. Many electricity-powered gas pumps in Japan that were once rendered disabled by the earthquake are finding new life, thanks to the ingenuity of bicycle-powered fuel pumps. The already eco-friendly personal vehicle transport option of carsharing finds an even greener shade with Enterprise Rent-A-Car adding 500 Nisson LEAF electric cars to the company’s WeCar carsharing neighborhoods in Santa Monica, Calif. Enterprise will also be adding Nisson LEAFs to its traditional rental car system.